Dandy Brandy and Rich Beach. As a lover of benefit products, I was extremely excited to use these products. 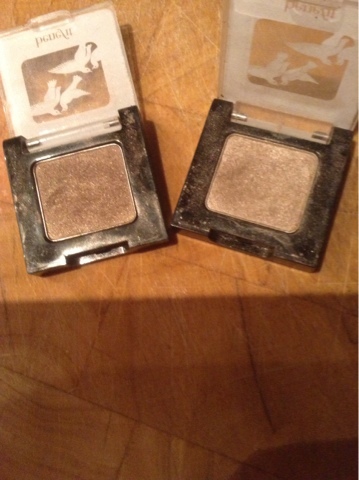 I adore these eyeshadows as there so velvety smooth. I personally don't apply an eyeshadow primer underneath as shadows don't tend to crease on me *oh yeah* I wear the two colours together as they really compliment each other, and as I have blonde hair and blue eyes, it's a perfect everyday natural neutral look for me.. I take the lighter colour and apply it all over the lid and up to the crease, and blend the darker colour into the outer corner of my eye to open it up and blend it into and along to the centre of the crease of the lid. I don't personally apply a primer, however applying Benefit's cream liner/shadow underneath really compliments the look and adds to the shadow staying put for longer. I also apply it underneath my brow bone for highlighter and brightness! I definitley reccomend giving these shadows a try as they will compliment all skin and eye colours! Especially for that everyday neutral look. What are your thoughts on these colours? Tweet me @alystephens or instagram me a photo! I would love to hear from you so please do leave a comment underneath!